Rumours on the tech grapevine hint at a production delay for Intel's next desktop CPU microarchitecture - codenamed Haswell - that may see the chip's retail availability pushed back from April to June 2013. It is known the new chip uses an LGA1150 socket that is incompatible with today's LGA1155 motherboards. This rumoured delay is good news for motherboard manufacturers who have invested heavily in Intel LGA1155 chipsets that accept second- and third-generation Core processors, also known as Sandy Bridge and Ivy Bridge. 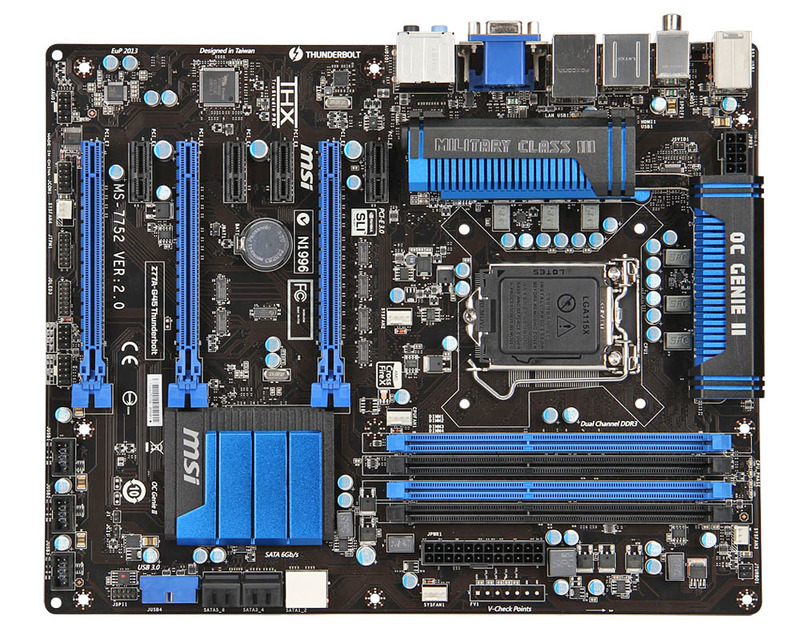 MSI is taking this time-sensitive opportunity to roll out a mid-priced Z77 (LGA1155) motherboard that, in addition to providing the usual smatterings associated with the chipset, also includes Thunderbolt support. Let's take a closer look at the £120 Z77A-G45 Thunderbolt. Presented in the usual full-ATX form factor, the black-and-blue colour scheme is nicely understated. Two heatpipe-connected aluminium heatsinks are properly screwed into the board; other companies often use flimsy pushpins that don't always travel well. Often a bugbear of ours, the 8-pin CPU connector is rotated and easy to get to, especially useful when chassis-routing holes leave little wiggle room for the stretched cable. The main motherboard protagonists all have company-specific cooling that's reckoned to be better than the competition. MSI's falls under the Military Class III banner, where super-ferrite chokes (SFC) are presumed to enable more current to pass through than regular chokes, to the tune of 30 per cent, while also increasing efficiency. Underneath the SFCs, MSI uses solid capacitors, as well. 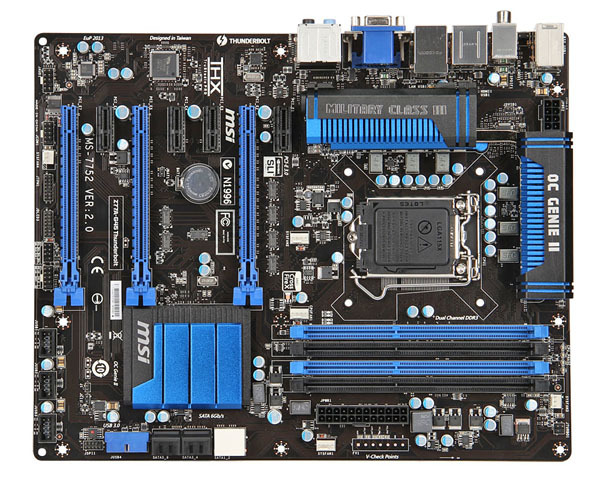 Producing a full-featured £120 retail Z77 motherboard requires a careful balancing act between enthusiast-aimed extras and general features. The right-hand side of the board has voltage-measurement points but there are no on-PCB buttons or debug LCDs. MSI doesn't bother augmenting the six Intel-provided SATA ports. We have no problem with this, but true enthusiasts may want to look elsewhere, as the Intel SATA Z77 topology is such that only the two white-coloured slots run at full-speed 6Gbps - the interface common on practically all modern SSDs. 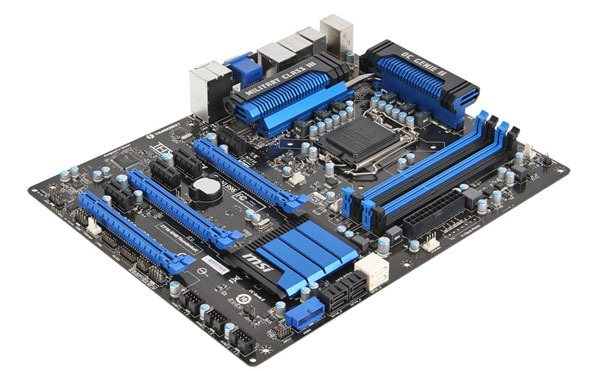 MSI, too, rotates the front-panel USB 3.0 header that's used to connect two of the board's four SuperSpeed ports to a chassis. We'd rather see it facing upwards than sideways, as a thick chassis-to-motherboard cable may be awkward to fit when dealing with smaller cases. Three system fan headers are on the right-hand side of the board along with the mid-PCB CPU fan header. Though purely a personal preference, we like to see it on the edge of the PCB, enabling slightly cleaner cable routing. A fourth system fan header is all the way on the other side, next to the Trusted Platform Module (TPM) header. Attaching front-panel connectors is fiddly at the best of times; MSI does the builder no favours by not highlighting the necessary pins in different, easy-to-see colours. You're unlikely to see the power switch and reset pins when peering into a dark chassis, and there's no Q-type connector in the bundle that would make connecting the pins significantly easier.